Of the three types of AC compressor technology (variable speed aka inverter, two-stage, and single speed) there’s no question that variable speed delivers the best comfort. There’s also no question inverter driven compressors are super-efficient by design. What Bosch brings to the table for consumers is affordability. 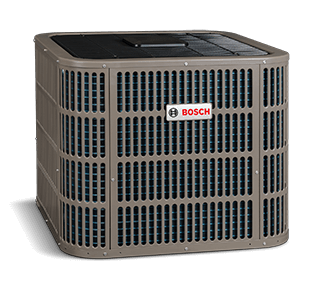 In fact, the Bosch variable speed heat pump costs thousands less than both the Trane XV20i and the Lennox XP25! Don’t be fooled by the lower price though. We’ve been all up and through this unit and Bosch’s world famous German engineering is easily apparent. The quality of materials would please even the toughest critic – in fact it already has, it pleased us. If you know anything about Magic Touch Mechanical, you know what we’re known for – we don’t strive to be the biggest, only the best. That means we only endorse products and brands that meet our high standards because – at the end of the day it’s our name on the line! With SEER ratings up to 18.5, EER ratings up to 13.0, and HSPF ratings as high as 9.5 the Bosch Inverter Heat Pump guarantees low air conditioning and heating bills. Saving thousands of dollars upfront with the low installation cost of Bosch’s heat pumps, combined with guaranteed savings every month with lower electric bills makes this model worth consideration. That’s not a typo, one of the most impressive things about the Bosch heat pump is its use of Mitsubishi’s variable speed inverter compressor. This is the same compressor that makes the Mitsubishi line of ductless heat pumps and air conditioners the number one selling ductless system in the USA. To understand why that’s so impressive, we should explain that we are one of the largest Mitsubishi Diamond Preferred Contractors in Arizona. 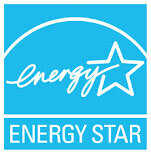 We install hundreds of these systems each year throughout the Phoenix area and have been for many years. We’ve yet to see this compressor fail – that’s a pretty big deal considering we’re talking about thousands of units. If you’re not familiar with how variable speed compressors work or what makes them so great, visit our blog and use the search tool with the keyword “variable speed”. The Bosch variable speed heat pump is 2 decibels quieter than the Lennox XP25 which boasts being “50% quieter than a standard heat pump”. When you consider the Bosch is quieter than what their competitor brags about being you get an idea of just how quiet this machine really is. As a matter of fact, the quietest heat pump system on the market today, the Trane XV20i, is only 2 decibels quieter than the Bosch. A human conversation is ~50dB-60dB. Bosch claims sound ratings as low as 56dB. One trend we’re not fond of in the HVAC industry is the manufacturers designing AC & Heating units that require the use of their own proprietary thermostat. Sure, most of these thermostats are packed with features and are actually quite attractive, but they’re also very pricey (captive audience). The Bosch heat pump can be used with almost every Wi-Fi and basic thermostat on the market today from Honeywell to Robert-Shaw. Note: The only thermostat not recommended for use with the Bosch heat pumps is the NEST. The algorithms of the unit and the NEST don’t play well with each other. When installed by a factory-trained Accredited Bosch Contractor (ABC) like Magic Touch Mechanical, you get an 11-year parts and compressor manufacturer warranty. Standard warranty when not installed by an ABC Dealer reverts back to ten years. We really like this unit and have no problem recommending it. We love the fact that this was really designed by Bosch and is not just another “white labeled” unit on the market like Maytag, Westinghouse and so many others nowadays. Bosch has figured out a way to keep costs low while keeping quality high. Variable speed technology is worth every penny for those who can afford it. The fact that the Bosch units installed pricing is competitive with some others two-stage and even single-stage units means more people can afford it. While Bosch is the new kid on the block compared to brands like Lennox, Trane, Carrier, and Goodman we’ve been impressed with the ones we’ve installed. If anything, we think some of the other manufacturers better watch out for Bosch! How Much Does a Bosch Variable Speed Heat Pump Cost? $6,900 – $9,600* including tax, installed (before any applicable rebates)! We’re talking about equipment, materials, labor, tax, plenums, drain pans, thermostat, etc. etc. etc. Getting into a variable speed heat pump for under $8k out-the-door was practically unheard of before Bosch came along. 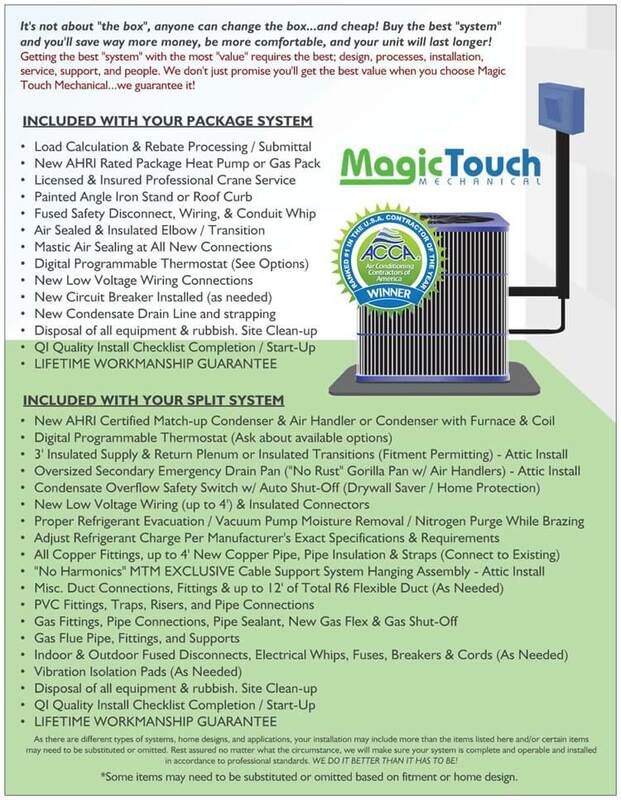 Aside from things like free maintenance, an ACCA approved Manual J load calculation, optimized airflow design, and more, here are some of the things that set a Magic Touch Mechanical installation apart from the others: What’s Included With This Installation? With factory rebates, utility rebates, and other promotions it’s possible to pay considerably less for this system.